Vegetarian Source of Protein – Paneer is a great source of protein and it must be included in any vegetarian diet in order to make up for the lack of meat and eggs. One cup of paneer contains almost 28 grams of protein, which comes to 56% of your daily protein intake. Satiating Food Option – Being a low-carb and high protein food, paneer helps to prevent overeating and unmindful snacking on unhealthy foods, which is extremely important for weight management. The slow release of energy from the protein helps to keep you energized for a long time without causing any sudden burst in energy levels. Aids Weight Loss – The conjugated linoleic acid or CLA present in paneer boosts body metabolism and promotes weight loss by speeding by the calorie burning process. Although, there are various other sources of CLA such as butter and red meats, but most of them are also high in saturated fats. Paneer is the only low-fat source of CLA. Improves Bone and Dental Health – Panner is a rich source of calcium which helps to reduce the risk of osteoporosis and other bone diseases related to calcium deficiency. It also helps to develop stronger and healthier teeth. Controls Diabetes – Cottage cheese is high in protein and low in carbohydrates, which makes it a healthy food for diabetics. High protein content in panner leads to slow release of energy in the body, which in turn prevents sudden spikes in blood sugar levels. Matar paneer or matar paneer masala is a popular Indian paneer curry recipe that is made with cottage cheese cubes and green peas cooked in onion-tomato gravy. It makes a delicious side dish that can be enjoyed with rice, roti or pulao. This is a low-spicy paneer recipe with mild gravy that can be enjoyed by the whole family including the kids. The sweet and crunchy green peas used in this recipe are loaded with phytonutrients, vitamins, minerals, fiber and antioxidants that improve digestion, improve the body’s resistance against infections and neutralize the damage caused by inflammatory free radicals. Paneer butter masala is one of the most popular North Indian paneer side dishes that can be enjoyed for lunch or dinner. The paneer butter masala gravy is prepared using a mixture of tomato puree, cashew nut paste, onions and some common Indian herbs and spices. It is a flavorful and non-spicy paneer recipe that goes best with roti, naan and paratha. The use of butter, oil and cashew makes it a high-calorie panner recipe but the butter and cashew also supplies some healthy fats to the body which are essential for healthy functioning of the body and enhancing satiety. 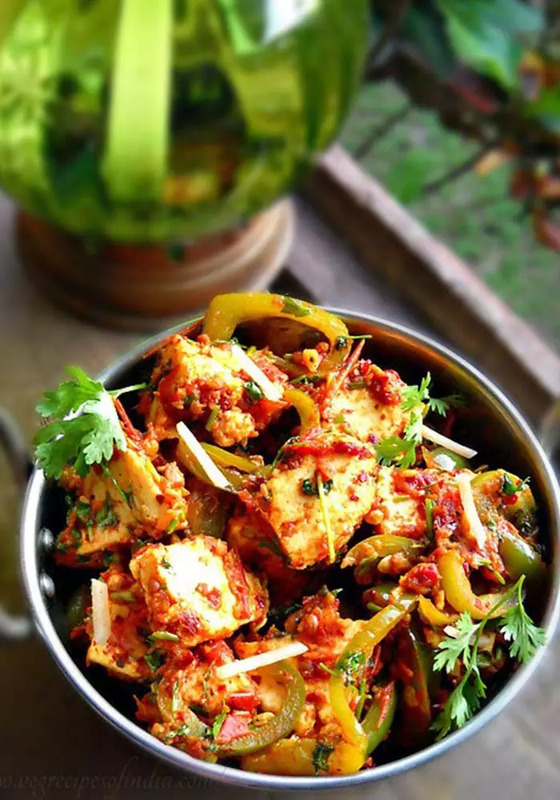 Kadai paneer is a famous Indian paneer recipe that is prepared by combining paneer cubes with onions and bell peppers and cooked in spicy tomato gravy with aromatic spices and herbs. This panner recipe consists of semi-dry gravy which makes it ideal for roti and paratha. The recipe is named “Kadai Paneer” because the cooking is done in a Kadai or Wok. Although, this is a spicy recipe, but the colorful bell peppers used in the recipe are bursting with powerful antioxidants such as capsanthin, violaxanthin, lutein, quercetin and luteolin that reduce the risk of cancer, prevent chronic diseases, improves eye health and protects the heart. Palak paneer is yet another hugely popular Indian vegetarian side dish consisting of paneer cubes cooked in thick spinach and tomato gravy and seasoned with herbs and spices. It is a non-spicy recipe prepared with very less oil. Palak paneer is a common item in Dhaba and restaurants and it tastes best with roti, naan or rice. The creamy and rich Palak or spinach gravy is packed with healthful nutrients. The antioxidant flavonoids in spinach prevent oxidization of cholesterol and protect the body from free radical damage. Folate helps to improve cardiovascular health while magnesium lowers high blood pressure. Spinach is also useful for maintaining brain functions related to memory and mental clarity. 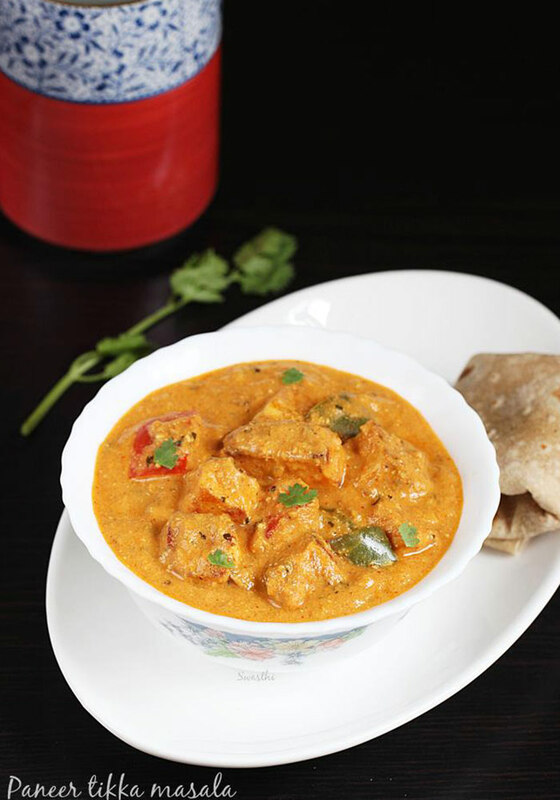 Shahi paneer is a flavorful and rich paneer curry preparation made by cooking the paneer pieces in thick gravy made up of cream, cashew paste, tomatoes and spices and seasoned with saffron. 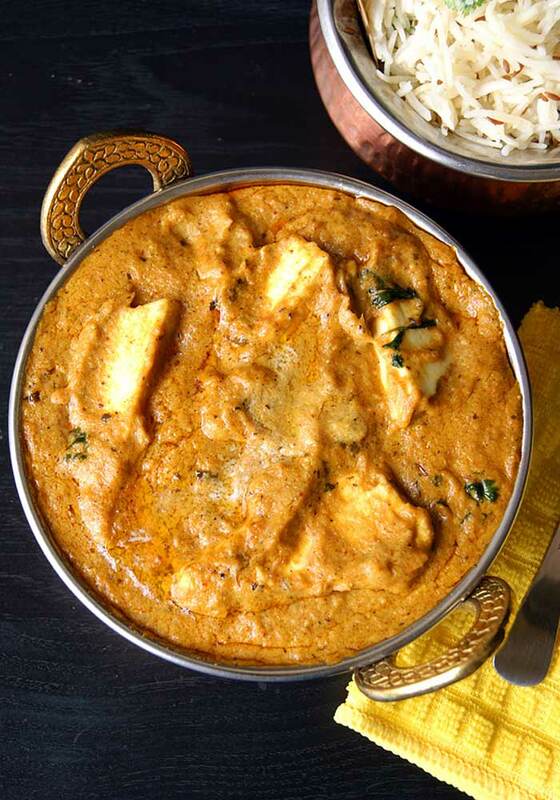 The term “Shahi Paneer” implies a royal dish that was served in the Imperial court. It goes well with tandoor breads, naan and roti. Shahi panner consists of creamy and mellow spicy gravy which can be served to people of all ages, including kids. The combination of milk cream or malai along with cashew nuts helps to supply some healthy fats to the body. 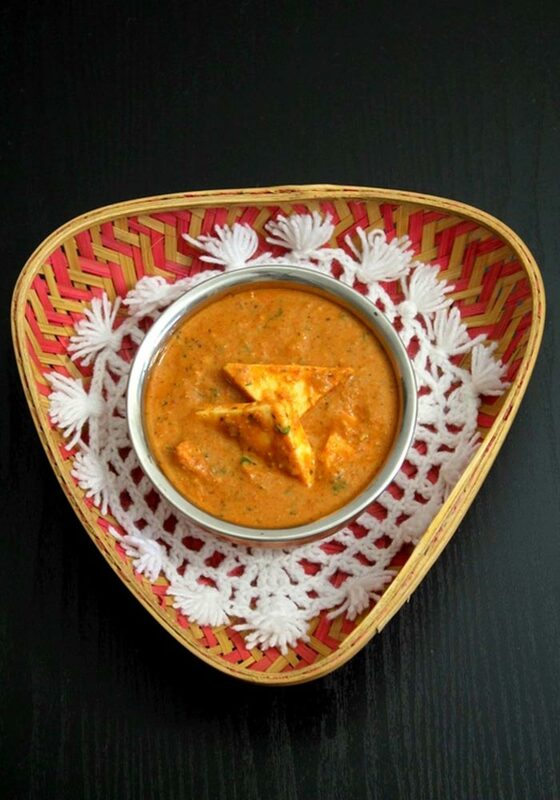 Paneer Makhani is a delicious and flavorful curry that has been influenced by Mughlai cuisine. The combination of tomatoes, cashew nuts, milk cream and butter in the gravy create some irresistible flavors that tastes amazing with paratha or roti. “Makhani” here stands for cooked with butter. The ripe red tomatoes used in the gravy are rich in lycopene that reduces the risk of prostate cancer, colorectal cancer and stomach cancer. The antioxidant vitamins C and A in tomatoes neutralize free radical damage and improve the absorption of calcium in the body. These vitamins also improve the health of the eyes, skin and hair. Paneer tikka masala is a spicy and flavorful North Indian paneer recipe in which the panner cubes, onions and bell peppers are dipped in a curd marinade, grilled to perfection and then cooked in spicy gravy. It tastes delicious with roti, naan, kulcha, jeera rice and biryani. The fresh bell peppers, onions and tomatoes used in this recipe add a potent nutrient punch to the recipe and supply a number of vitamins, minerals, antioxidants and fibers. This recipe does not make use of any food color. The rich red color of the dish is achieved using good quality turmeric, red chili powder and tandoori masala. Chilli panner is a classic Indo-Chinese recipe that is influenced by both Indian and Chinese cuisine. 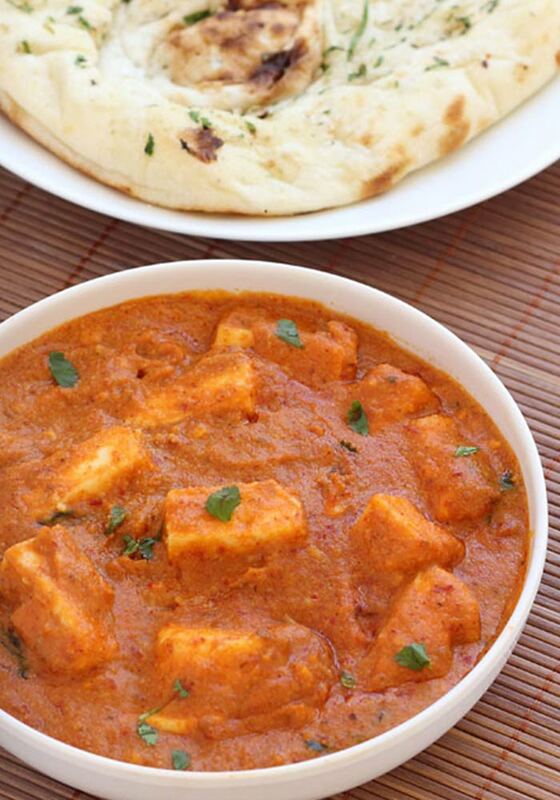 In this recipe the Indian cottage cheese or paneer is stir fired and cooked in gravy consisting of Asian sauces. 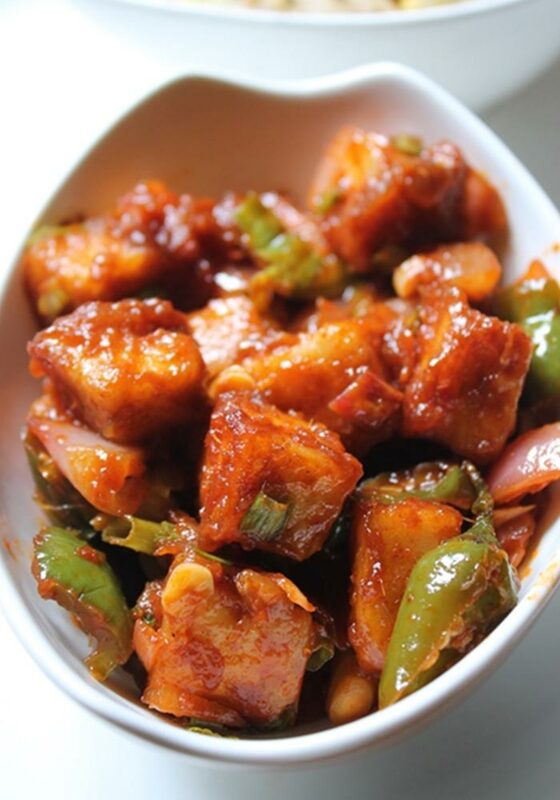 While chilli paneer gravy goes well with fired rice or noodles, dry chilli paneer works as a great appetizer or snack. The combination of sauces and spices makes it a healthy and rich recipe that is best to enjoy as an occasional treat. But the use of fresh green capsicum, onions and spring onions renders a healthy touch to it. Methi malai paneer is a rich and creamy paneer curry prepared by cooking the panner pieces in a mellow spicy curry made of fresh fenugreek leaves, onions, tomatoes, fresh cream and spices. This preparation goes well with all types of Indian breads and its non-spicy nature makes it suitable for people of all ages. Fresh fenugreek leaves used in this recipe are loaded with vitamins, minerals and antioxidants. A natural soluble fiber galactomannan present in fenugreek leaves reduces the risk of heart diseases, controls blood sugar levels, aids digestion and promotes weight loss. Vitamin C in fenugreek soothes skin inflammation and treats various skin problems. Paneer Pasanda is an elaborate and time taking recipe that has to be prepared with patience, but the end result is totally worth the effort and time. This is a rich and flavorful recipe in which a filling of cashew, raisins and dry coconuts is stuffed between two layers of paneer, dipped and a batter and fired to perfection and then the fries are cooked in spicy gravy. The thick gravy tastes heavenly with warm roti or Jeera rice. The raisins and nuts filling used in this recipe is packed with essential nutrients such as mono-unsaturated fats, vitamin B6, iron and finer that prevents cardiovascular problems, reduces the risk of stroke, cures anemia and lowers high cholesterol levels in blood. Paneer tikka tops the list of most popular Indian appetizers that is loved by both vegetarians and non-vegetarians. The delicious smoky taste of oven-grilled paneer that melts in the mouth makes it the show stopper at parties. You can either use a traditional charcoal grill or an electric grill to prepare the paneer tikka. The best thing about this panner recipe is that it does not require any oil, butter or ghee for cooking which makes is light and healthy even for weight watchers. The grilled paneer, bell peppers, onions and mushrooms provide some wholesome nutrients to the dish. 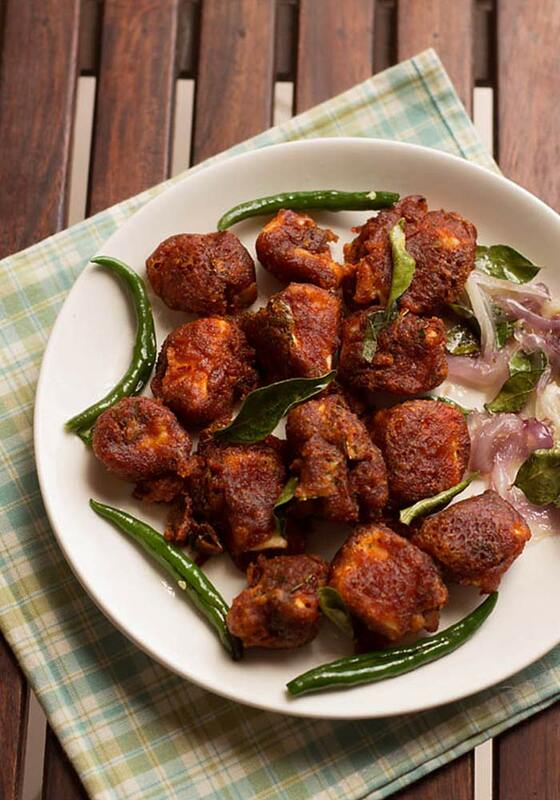 This is a popular Andhra style paneer recipe that is served as a snack or starter before a full course meal. The nice crispy coating of the paneer with its spicy, hot and tangy taste is sure to be a show stealer at parties and gatherings. Serve it with some onion rings and green chutney and let the feast begin. Although, it is a deep fry recipe, but it can be shallow fired as well if you want to control the calories. Unlike restaurants, this recipe does not make use of food color. Red chili paste and powder renders a bright red color to the dish. Paneer bhurji is a delicious and healthy side dish that is made by combining mashed paneer with onions, tomatoes, green chilies and spices. It is a healthy breakfast substitute for scrambled eggs. It can be enjoyed spread over toast or with naan, roti and chapati. It also makes a scrumptious snack by itself. Paneer bhurji is a healthy snack recipe that does not require any deep frying but it still tastes amazing. The minimal use of spices and oil in this recipe keeps it absolutely light and delightful and can be enjoyed even by health conscious people and weight watchers. The inclusions of green peas provide some much needed fiber and antioxidants. Paneer Pakora is a popular tea time snack that can be prepared in a jiffy and requires only a few basic ingredients. The crunchy batter coated panner pieces dipped in green chutney or tomato sauce is a treat for all pakora lovers out there. Serve it as an afternoon snack with tea or coffee and indulge in its delicious taste. Although, it is a deep-fried recipe but you can soak out the excess oil by placing the pakora over tissue paper. The mixture of gram flour and rice flour in the batter helps to keep it lighter. The inclusion of carom seeds (Ajwain) makes it easily digestible. Panner Kathi Roll is an extremely popular Mumbai street food that marked for its spicy and savory taste. It is a Frankie style recipe in which a paneer filling prepared with spices and green chutney and wrapped in freshly prepared chapati and served with tomato sauce. It makes a delicious and filling evening snack or lunch box recipe. The use of wheat flour instead of all purpose flour gives a healthy touch to it. Inclusion of fresh spinach, tomatoes and capsicum in the paneer stuffing supplies some essential vitamins, minerals, antioxidants and fiber to dish. Indian style Paneer Puff is a popular snack inspired by the western Puff Pastry. This is a delicious and mouth-watering recipe which is prepared by filling puffy and crunchy pastry with a paneer and spinach filling that has been cooked with spices and herbs. They make great snack and starters for parties and a healthy lunch box idea for kids. The best thing about this recipe is that is involves no deep frying. The entire baking is done in the oven which helps to retain the nutrients in the ingredients. 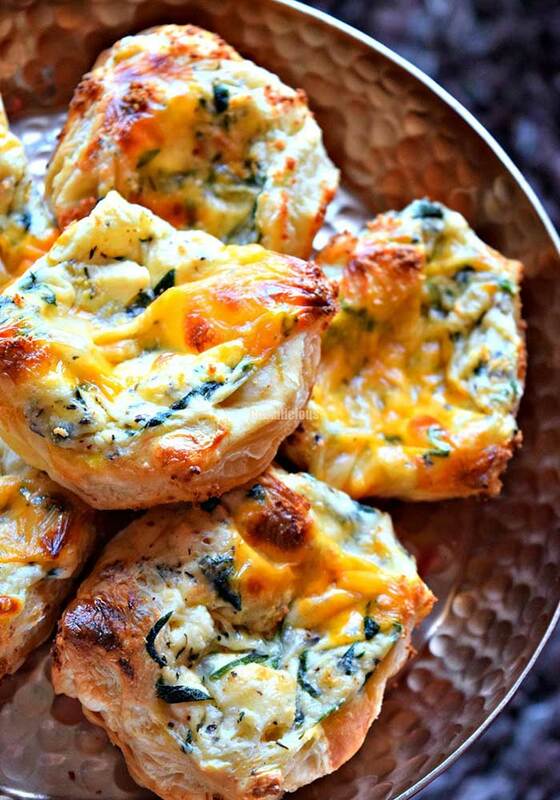 The use of spinach and Mozzarella cheese enhances the health quotient of the recipe and makes it more filling. The Kerala style spicy Paneer pepper Fry is a delicious and savory appetizer that can be enjoyed on its own or paired with roti or chapati. The use of hot peppers and spices in the marinade makes this recipe bursting with flavors. If you are not a fan of savory foods then you can adjust the amount of green chilies and black pepper powder as per your taste. Despite being spicy and savory, this paneer recipe is low in calories because the marinade is extremely light and the preparation does not require deep frying. All the ingredients along with the marinated paneer are just stir fired in the pan. The Paneer Cutlet is a appetizing and mouthwatering snack that represents a combination of crunchy bread crumb coating and soft paneer and potato filling that tastes delicious with ketchup or mint chutney. It makes the perfect tea time snack that can be served during the afternoon. Although, the traditional cutlet recipe involves deep frying, but you can shallow fry it as well in order to limit the calorie intake. The combination of potato and paneer in the filling adds some healthy carbohydrates and starch to the recipe which makes it absolutely satiating and filling. 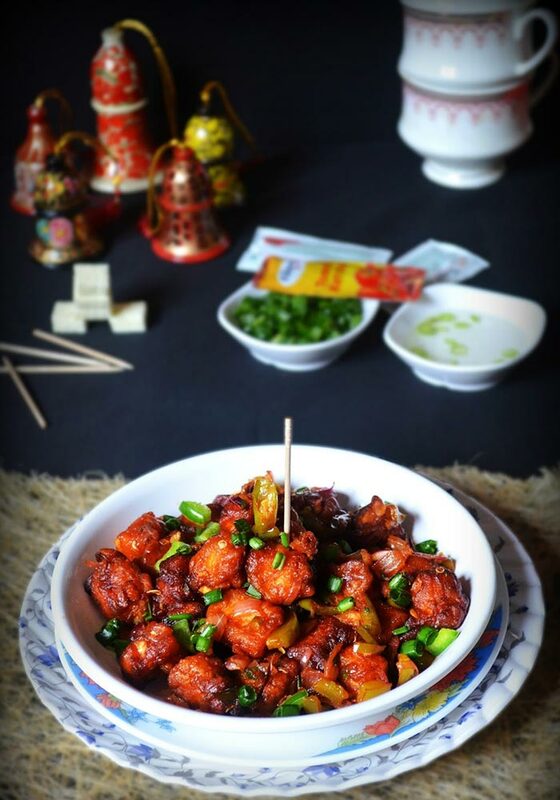 Hot and crispy Paneer Manchurian is a popular Indo-Chinese dish that is often served as an appetizer or starter. It also goes well as a side dish with fired rice or noodles. It is a spicy and tangy recipe in which the panner cubed are dipped in batter, deep fired and then cooked in gravy made with Asian sauces. This recipe includes a lot of spices, sauces and oil which makes it a bit heavy. But the inclusion of onions, green capsicum and spring onion greens adds a health punch to it. But it is best to enjoy Paneer Manchurian as an occasional treat. Golden fried paneer, potato and sweet corn balls are the perfect finger food to brighten up a dull and boring evening. These panner balls are crispy from the outside and soft and cheesy from inside. They can be served with piping hot tea or coffee or with some ketchup or mint chutney. Although, this recipe involves deep frying but it makes minimal use of spices. In addition, the use of potatoes, corn and Mozzarella in the paneer balls adds some carbs, fiber and healthy fats to the dish and makes it wholesome and nutritious. 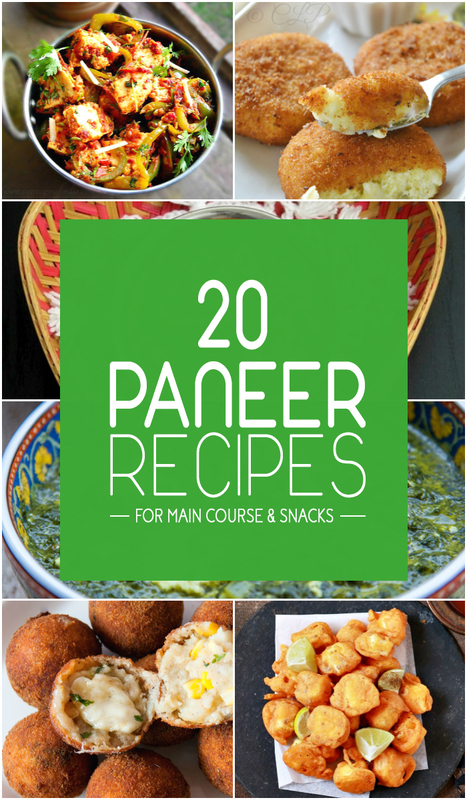 So, now that you have recipes for some of the most popular panner dishes; prepare these restaurant style panner curries and snacks in your home and surprise your family and friends with your cooking skills.